Vertical aerial photograph of Le Havre. There are large numbers of bomb craters and smoke and explosions. Captioned '6106 BIN 10-8-44 //8 10000' [arrow] 115° 1840 Le Havre X 13x1000 4x500 c 24 secs F/O Lester L 460'. Vertical aerial photograph of Emmerich. The Rhine is at the top left. Some smoke and explosions are visible next to the river. 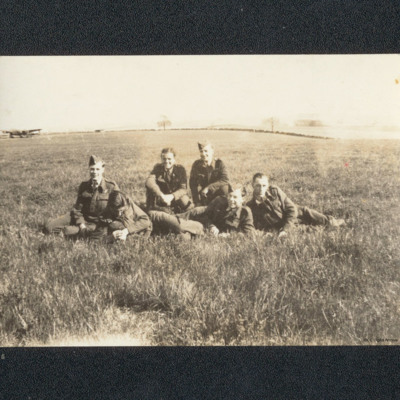 Captioned '6348 [undecipherable] 1000 [undecipherable] Emmerich [undecipherable] L460'. 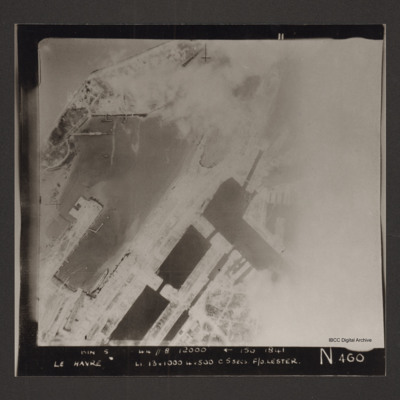 Vertical aerial photograph of Le Havre showing part of the dock area. Captioned 'BIN 5-8-44 //8 12000' [arrow] 150 1841 Le Havre Li 13x1000 4x500 c5secs F/O Lester N 460'. Vertical aerial photograph of the dock area at Le Havre. The right side of the image is obscured by cloud or smoke. Captioned 'BIN 5-8-44 //8 12000' [arrow] 150 1841 Le Havre Li 13x1000 4x500 c5secs F/O Lester N 460'. Vertical aerial photograph of Le Havre. Much of the centre of the photograph is obscured by explosions and smoke. Captioned 'Captioned 'BIN 5-8-44 //8 12000' [arrow] 150 1841 Le Havre Li 13x1000 4x500 c5secs F/O Lester N 460'. Vertical aerial photograph of Calais. Craters and bomb explosions are visible but no detail apart from a road junction and the coastline. 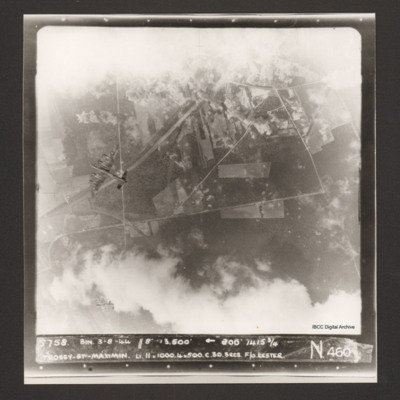 'Captioned '6262 BIN 27-9-44 //8 4000' [arrow] 142° 0912 Calais w. 13x1000. 4x500 c.19 secs. F/O Lester N 460'. Vertical aerial photograph of Raimbert V-2 storage site. The bottom right of the image is obscured by cloud. A vertical aerial photographs of Pauillac. Cloud and smoke obscures about half of the image. There is a small ship floating on the river. Captioned '5769 BIN 4-8-44 //8 8000' [arrow] 110° 1803 Paulliac. Li. 9x1000 3x500 c 23 secs F/O Lester. N 460'. 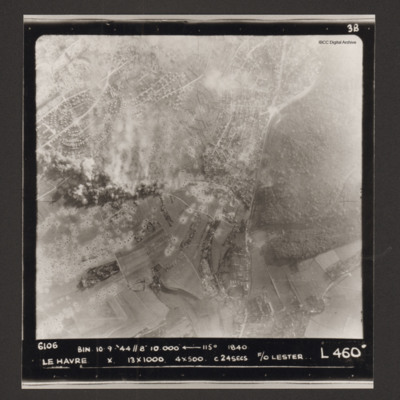 A vertical aerial photograph identified as Bois Desjardins. Much of the image is obscured by bright lights. Captioned '5691 BIN. 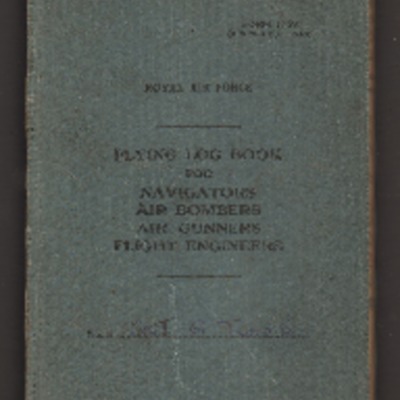 25/26-7-44 //NT(C) 8" 10.000' [arrow] 070° 0253 Bois Desjardins Y. 18x500. 19 secs. P/O. Lester. V 460'. 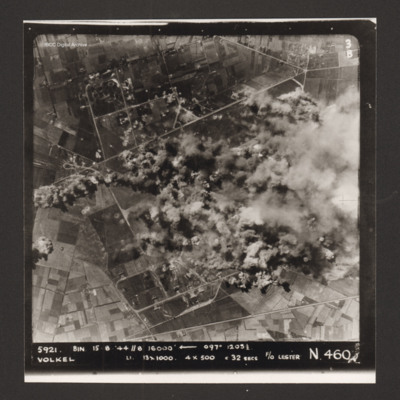 Vertical aerial photograph of bombing of Ardouval. The bottom half of the image is partially obscured by bomb explosions. Captioned '5656 BIN 25-7-44 //8 14000' [arrow] 125° 0843 Ardouval S 11x1000 4x500 c 30 secs P/O Lester T. 460'. 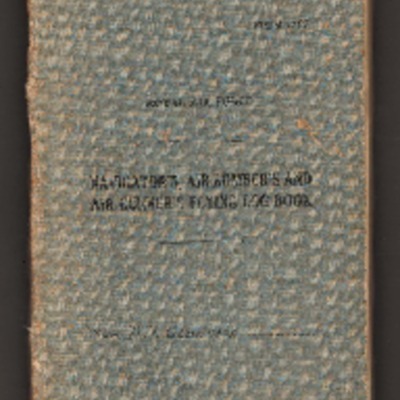 A detailed account of when his Lancaster 'Q', ND392, was attacked by an enemy aircraft. 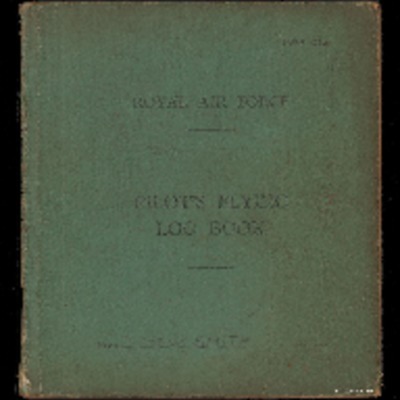 He repeatedly travelled the length of the aircraft to assist the air gunners. 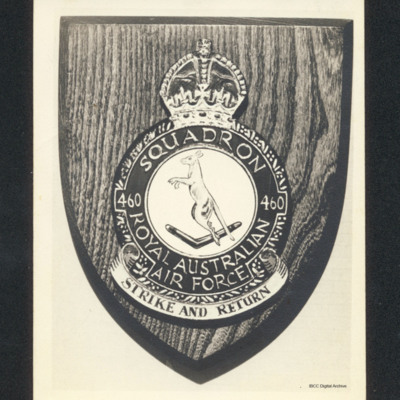 A wooden plaque of 460 Squadron, Royal Australian Air Force. It has the motto 'Strike and return' and a depiction of a kangaroo and a boomerang.